The industrial giant's investments in the industrial Internet should enable it to grow its all-important service revenue. The market didn't receive General Electric Company's (NYSE:GE) latest earnings report very well, even though the industrial giant maintained full-year 2016 guidance. For obvious reasons, most of the immediate attention focused on its oil and gas segment, but I think its overall services business, and particularly services orders, is the key metric to follow this year. Here's why. We primarily ship from backlog, so orders and backlog growth matter. In 2015, six of seven businesses grew backlog, some substantially. When we do our analytics around convertible backlog and business performance, we see a path to 2% to 4% organic growth for '16, even with a very difficult oil and gas market. IMAGE SOURCE: GENERAL ELECTRIC COMPANY PRESENTATIONS. Backlog grew nicely, and the integration of Alstom helped equipment order growth turn positive. But the really impressive outcome was organic service growth of 3% in the quarter (5% including Alstom). Why is this impressive? 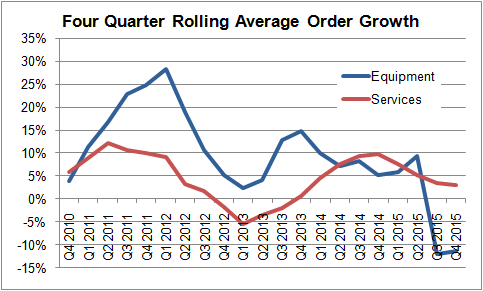 The following chart shows how equipment orders tend to lead into service orders, and since services tend to be higher margin, any decline in service orders will be felt in revenue and earnings in future quarters. Incidentally, the equipment orders line is negatively affected because of a comparison with a very strong fourth quarter of 2014, where the company won $4.9 billion worth of orders for its aircraft engines. Nonetheless, equipment order declines are equipment order declines, and the company did a good job increasing organic service orders 3% in the fourth quarter. Of course, the next question is: Can it continue? Immelt was asked this on the earnings call, and here's part of his answer: "I would start again with the digital focus, which is growing 20% not just in power, but in other businesses. But we also have very targeted programs in all of our businesses." He went on to outline the opportunities to sell services into Alstom's installed base, and opportunities within aviation and healthcare, but he said the "No. 1 driver" is its digital activities. It helps retain General Electric equipment customers. It gives a value-add for its services offerings, especially with its big data analytics platform-as-a-service cloud solution, which helps customers capture and analyze data. Data analytics will more efficiently inform customers of when their equipment needs services. 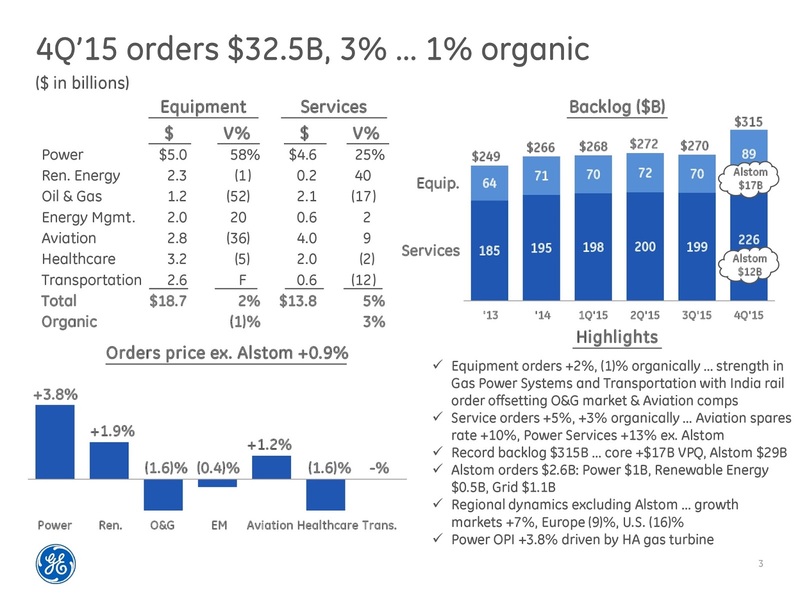 While much of this is well known, it's time for the company to demonstrate the efficacy of these arguments, because General Electric needs service orders to continue growing -- particularly in a slowing global environment. All told, the key metric to follow this year will be service orders. If the company can keep them in the 3%-to-5% range, then investors will be able to see the tangible benefits of the company's investments in the industrial Internet. Moreover, such an occurrence would highlight the growth opportunities from investing in digital solutions -- an area where the company is leading the way. The economy may not be helping much, but General Electric's investments in the industrial Internet look set to generate tangible benefits to the bottom line in 2016.